Manage key manufacturing operations and take critical decisions with confidence. Rootstock is the next-generation, cloud ERP solution that fully leverages the Salesforce platform, interacting natively with Sales Cloud, Service Cloud, CPQ, Field Service Lightning and other Salesforce solutions. 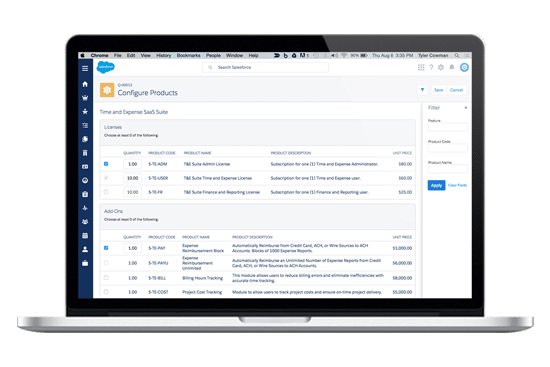 For existing Salesforce users, Rootstock builds off of your existing products, sales and customer data, business objects, and business rules in Salesforce to provide a complete, end-to-end view of your manufacturing operations, inventories, supply chain, and finances. Rootstock offers the power of an integrated ERP solution on a single screen—including on mobile devices—while leveraging the familiar Salesforce user experience. By leveraging your existing data and business logic in Salesforce and eliminating multiple applications and workflows, Rootstock provides you with a single source of truth for taking critical decisions affecting production, inventories, and cash flow. With its ability to model all aspects of the manufacturing process including BOM, capacity planning, production planning, scheduling, reservations, and allocation, Rootstock provides you with an end-to-end view of key business processes such as order-to-cash and procure-to-pay. Rootstock is easily customized to meet changing business needs, such as validating and deploying new business models and responding to competitor actions. Eliminate the gap between ERP and CRM to become a more customer-centric and agile company. Get complete visibility of all your customer interactions and understand your business from end to end. As a cloud-based ERP, Rootstock runs natively on the Salesforce platform and benefits from future enhancements to it. As a result, Rootstock provides a solid foundation for enabling both company growth and product innovation. Connect people, data and things to a consistent set of data. Stay in close contact with your customers, suppliers and employees with embedded social media and custom portals, and on any device from anywhere in the world. Operations data is updated and accessible in real-time for use by multiple manufacturing workflows. Customizable dashboards provide executives with access to the latest key performance indicators (KPIs), while mobile alerts offer actionable insight to operations managers. Requests to sign-off on production changes can be made and approved from different devices with the Salesforce mobile application. While Nubik knows that each manufacturing organization is unique, we have identified numerous repetitive, foundational tasks during ERP implementations. This accumulated experience enables Nubik to proceed fairly rapidly through the QuickStart process, giving you a running start in deploying cloud-based ERP. During this process, we will work with you to map out and then leverage your existing data from Sales Cloud, Service Cloud, App Cloud, and Force.com. We will then work with you to understand your current manufacturing and supply chain business processes and workflows; these are modeled and tested across multiple stakeholders before implementation. Combine Rootstock with Salesforce CPQ to fully harmonize the Order-to-Cash process, and to take advantage of real-time inventory availability, capacity, logistics, and shipping timeframes, as well as customer credit information. Seamlessly integrate quotes between Rootstock and Salesforce CPQ to speed fulfilment, invoicing, collection, and accounting. Integrate with suppliers including with electronic data interchange (EDI) flows. Add support for electronic signatures up and down the supply chain with eSignature. Further extend with apps from Salesforce AppExchange. Combine Rootstock with Salesforce Field Service Lightning and allow for exceptional customer experience even once your devices are shipped and deployed in the field. Nubik has first-hand experience implementing Salesforce solutions, including Salesforce CPQ and FSL, for a variety of manufacturers and technology companies. As a result, Nubik can tailor your Rootstock implementation to your business’ specific requirements and those of its users, while leveraging its experience with and insight into best practices, providing your business with a solid cloud-based foundation for future growth. Sign up for a free online demo about Rootstock and learn how you can transform your manufacturing activities.